The item South park faq, Dave Thompson, (ebook) represents a specific, individual, material embodiment of a distinct intellectual or artistic creation found in Charlotte Mecklenburg Library. There are few modern animated television shows that could survive over a decade and a half and remain as funny...or as stupid...or as sick...or as depraved...today as when they started. Even fewer can claim to cater to "mature" audiences, while their critics complain that everything about the show is immature. And fewer still where, for the first decade or so, one of the main characters was killed off every week. Then returned, no worse for wear, seven days later. That, however, is the world of South Park, and this is a book about that world. A journey through the lives, times, and catastrophes that have established the tiny mountain town of South Park, Colorado, as America's favorite dysfunctional community. A voyage into a universe where Barbra Streisand is reborn as a Japanese monster movie; where Kentucky Fried Chicken is a registered drug; where Canada is forever on a footing for war; and where we discover that even feces love Christmas. 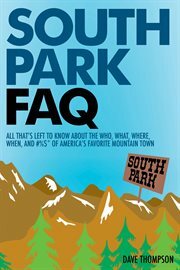 From Zebulon Pike to Chef, from Brian Boitano to Mel Gibson, from "Super Best Friends" to South Park: Bigger, Longer & Uncut, it's all covered in South Park FAQ. Featuring A-Z coverage of the all the characters readers have come to know and the stories behind the episodes, it also includes an episode guide and an appendix of all of the songs featured in South Park. Nothing is sacred and nobody is safe. Even physical and emotional disabilities are just another banana skin for someone to slip on, and the term "politically correct" has been translated into "oh good, you're getting annoyed." It is a place where...you get the picture. This is not Bambi!